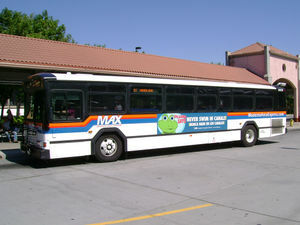 Modesto Area Express (MAX) is a local bus system in the City of Modesto. MAX connects with Stanislaus Regional Transit (StaRT), which provides regional bus service between Modesto and other cities in the county. On weekdays, MAX provides express bus service to connect with ACE at Lathrop/Manteca Station and BART at Dublin/Pleasanton Station.